After a day of utter grey – the flat-light, little-hope, kind of grey – some serious winds blew into town. Unexpected winds. Blow you down kind of winds. And, wiped the grey away. 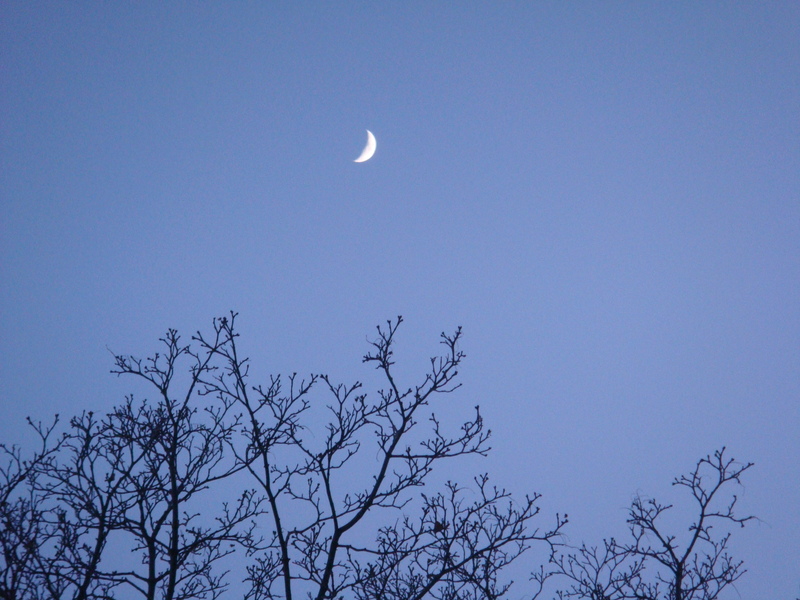 Sign of hope – coloured twilight blue, and in the shape of the crescent moon. So simple and beautiful. My camera doesn’t capture the moon at all so I always appreciate moon photos. 🙂 And the silhouette of the trees is so delicate, like a sketch. Sometimes we receive what we need to receive – a small gift from the universe. What lovely blue. It just doesn’t get any more simply beautiful than this! Gorgeous winter blue light! Lifts the spirit, doesn’t it just. What a beautiful photograph of the moon, especially against that gorgeous sky! Lovely twilight moon! So nice to see the gray go away. A very thoughtful consideration on the ‘moon’ theme this week, thank you for submitting it to the link party! Thank you, Lianne! It was such a pleasure visiting your site!